When rain hits your roof, it should roll right off into the gutter and flow away from your property. If this doesn't happen, it could be compromising the integrity of your roof and damaging the foundation of your home. Our business specializes in gutter installation in Ann Arbor, MI, to residential and commercial structures. For more than 30 years, Imperial Building & Roofing has served clients by helping to transform their homes and businesses and improve the functionality of their properties. Gutters help protect roofs and foundations by redirecting rainwater brought by storms away from the roof, windows, sliding doors, and other entry points. Allowing rainwater to flow freely from your property helps decrease the chance of mildew and mold growth, siding damage, and flooded landscapes. After experiencing years of wear and tear, the gutters on your home will eventually need to be replaced. Hire our qualified crew to install some new gutters and downspouts and help prevent water damage to your home down the line. Your gutter system is designed to help avoid backsplash from your siding, protect your landscape from erosion, and keep your roof from flooding. Over time, wind can tear gutters from your roof. Debris and water build-up can weigh your gutter system down, and pull it away from the correct spot, even to the point of breaking. By virtue of their placement, issues with gutters often go unnoticed. However, that doesn't mean that functional gutters aren't essential to keep your home or business well-maintained. If your current gutters aren't performing up to par, look to Imperial Building & Roofing for new gutters and downspouts that will ensure your home or business stays protected even during the rainiest of months. Available in aluminum and seamless copper, our gutter systems come in a variety of colors and two different sizes. In addition, our crews use hidden fasteners and brackets to install your gutter systems. Also called hidden hangers, unlike nails, these fasteners won't rust after years of exposure to the elements. This will ensure that you get the most from your investment. When installed correctly, new gutters protect your property from water damage and provide an invaluable aesthetic boost. By working with our trained crews, you can have the utmost confidence that your new gutters will be installed the right way the first time. With many different colors available on the market, it will be easy and fun to find the right replacement gutters to fit your home's unique style. Gutter installation services should only be performed by trained professionals to ensure you receive the best possible results. When you put your installation needs in the hands of our qualified crew, you are sure to receive a system that provides your property with the outstanding workmanship warranty and manufacturer's warranty you deserve. Our crew takes pride in their work and are available to provide their services all year round, 52 weeks a year. With this in mind, we're happy to provide you with a free quote on the new gutter and downspout installation, whenever you need it most. Whether you are in need of new gutters, before the summer rains come or you just want to upgrade your home's curb appeal, our exceptional crew is prepared to accommodate your needs. Share your thoughts with us, and we'll help you find a gutter system that best suits your needs. Contact us at (734) 995-9955 to fit your home or business with a new gutter. 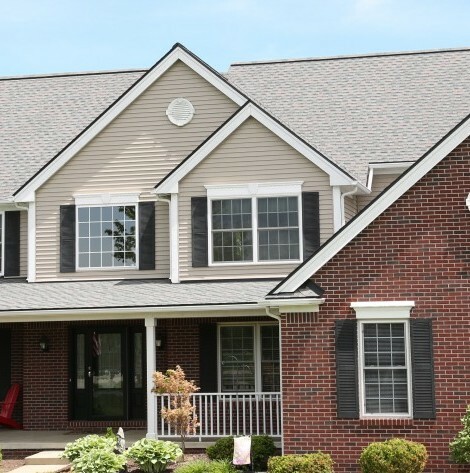 We proudly serve homeowners in Ann Arbor, Michigan, and provide multiple services ranging from new siding to roof installation to other services in Ann Arbor and surrounding areas.